Hark! The bugles sound the call of victory, for the fearsome Dragon has been smote and a great reward has been bestowed upon you, our faithful Tycoons: our MEDIEVAL PxP PACK! 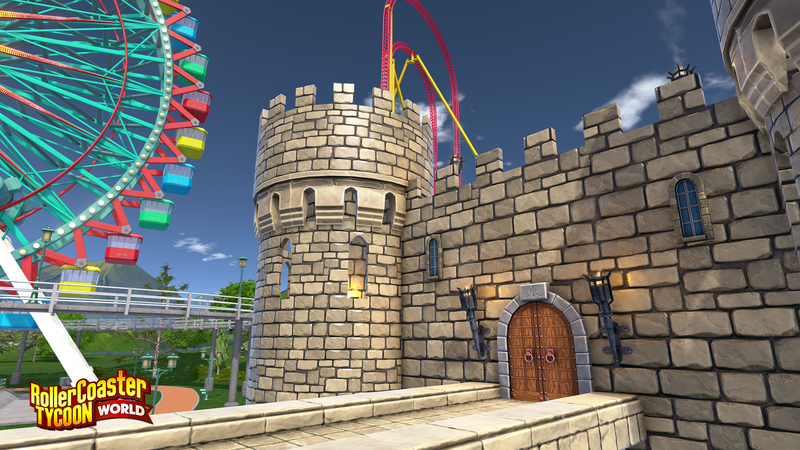 Our latest update includes over 67 new Medieval PxP pieces to bring your park to Olde Timey-life. As usual we also have a number of fixes and optimizations include in this update. Read on for more details, and playeth RCTW today! Crash: – Game hangs when selecting the PxP Miniature Maze Prefab. Crash: – Clicking on a Peep that purchased from a deleted souvenir shop or food stand causes a freeze. Crash: – Game will hang once the user has clicked on modify path, the finance tab and the heatmap. General: – Replicate keyword filtering feature to relevant placement tools. General: – The word filtering does not reset when changing category. General: – Grouping and moving groups are not working as designed. General: – Loans can be repaid without the necessary amount of money. PxP: – PxP Deco & Lights pieces do not show a degree of rotation when rotated. PxP: – 3 of the Sci-fi PxP are missing display images. PxP: – Editing a PxP building and then opening the PxP Buildings menu causes the game to freeze. Scenery: – The Pink tulip scenery does not highlight when selected. Atari, why don't you just take some time to reply to the feedback and fix those bugs that have been reported over the last year? Atari, you should be ashamed of the way you're handling this disaster of a game, except I know you're not because you don't care! I can see this is still a hot mess. So glad I play Planet Coaster. I see I'm the only one glad for some more PxP pieces. Other stuff is important to me, but one of the big things I feel PC has over RCTW is the amount of scenery and PxP pieces they have. So for me, I'm glad for this update and they did fix the PxP issue I was experiencing when working on PxP and going back to the PxP menu. At this point why still complain? The updates are still coming so maybe we will get transport rides or some of the other stuff. I just don't see the use of people on the boards stating the obvious over and over and over again. Not comparing the game to PC, it's actually a decent game. Believe it or not, I've enjoyed the game lately. Sorry to say this, but this game is just like a pool made of rubber, and tiny Holes begins to leak water out, but they just put gips on it. But they should rip it apart and build it with concrete. That is how i feel about this game now.. Way to many bugs and they dont fix them, all they just do is adding water to the rubber pool, with all there PxP and soon it will blast... Been there from the first stream rctw had on twitch, and i did have to high hopes for this game. I fully agree with MontyMamba, as there may still be a lot left to improve in the game, but it's also a lot better than most commentators suggest. I can't think of any game which doesn't have any flaws in it and provides everything that people ask for. It's an enjoyable game and deserves more praise and support than it currently gets in general. Besides, the game Rokh will be released on the 16th of May, so the developers of Nvizzio will have more time for other projects afterwards, such as RCTW. Therefore, I'm looking forward to the summer updates! Last edited by Elessar_Luzente; 05-04-2017 at 08:32 PM. The pieces are nice but still things missing like everything that was promised at the start of EA. It had alot of potential at one point, but I honestly do not think most people will find it enjoyable in it's current state, which is why so few people are playing or talking about it now. Rokh was also in development during at least most of the development of RCTW by nvizzio. I think the real reason why there has been no updates is because Atari is no longer paying them to do so, which can be seen by looking at the history of their internal dev build on steam. Normally when a game is active and under development that internal build is updated weekly and that is how it was until a few months ago. Now it sits untouched for about a month before they "work" on it for a few days just before a patch like this one releases. My bet is that they made a contract to have one single person or so slip in a few PbP updates for the duration nvizzio is still actively developing RCT touch, just so that there is at least the illusion of it being supported still. The only way development ramps up after ROKH releases is if nvizzio does it for free and that is not likely to happen.